TAMPA, Fla. - Tyler Hill crushed a three-run home run in the seventh, but Tampa (2-5) pitchers issued a season-high 11 walks and the St. Lucie Mets claimed the series with a 4-3 win on Wednesday night at George M. Steinbrenner Field. RHP Clarke Schmidt allowed two of his career-high five walks in the first, as St. Lucie (4-3) scored in the opening inning for the third-straight game. Blake Tiberi singled, and Hansel Moreno legged out a bunt hit before Schmidt walked Desmond Lindsay, loading the bases with no outs. Tiberi then scored as Quinn Brodey bounced into a 6-3 double-play. One walk later, Schmidt got a groundout to end the frame. Déjà vu happened for Schmidt in the third, as Tiberi, Moreno and Lindsay all reached to begin the inning. Tiberi then scored on a sacrifice fly by Brodey, and Moreno crossed the plate on a throwing error by third-baseman Oswaldo Cabrera , giving the Mets a 3-0 lead. A walk and a single followed, but Schmidt got a strikeout to strand two more runners. The right-hander returned for the fourth and retired the first two batters before LHP Dalton Lehnen entered in relief. Schmidt (L, 0-1) allowed three runs (two earned) on five hits in three and two-third innings. The 23-year-old struck out three while issuing a career-high five walks, throwing 39 of 79 pitches for strikes. RHP Briam Campusano (W, 1-1) started for St. Lucie and stymied the Tampa hitters through five scoreless innings, scattering two hits and a walk while striking out three. A pair of walks helpd St. Lucie reload the bases off Lehnen in the fifth, and a run scored on a base hit by Cody Bohanek before Lehnen got a strikeout to leave the bases full. Steven Sensley and Isiah Gilliam lined back-to-back singles off RHP Marcel Renteria with one out in the seventh. One out later, Hill lined a ball just over the wall in left-center field, cutting the deficit to 4-3. Lehnen turned in four and two-third innings of relief, striking out five while yielding one run on three hits and four walks. RHP Braden Bristo took over in the ninth, with one out and a runner at first. A pair of walks loaded the bases, but Bristo got a pop-out and a strikeout to escape the jam. RHP Conner O'Neil (SV, 1) worked around a two-out single by Pablo Olivares in the eighth before tossing a perfect ninth to seal the game. Sensley (1-for-3, BB, R) was the lone Tarpon to reach base twice. Hill (1-for-3, HR, 3RBI, R) hit his first home run since May 20th, 2018 with Single-A Advanced Salem. 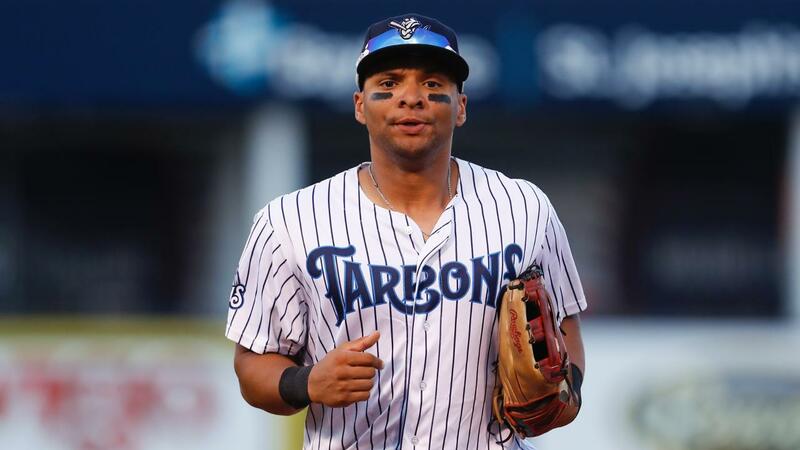 The Tarpons will look to salvage a win in the series-finale on Thursday morning, when RHP Deivi Garcia (0-1, 10.80) starts against RHP Tony Dibrell (0-0, 4.50) at 10:30 a.m. on Fifth Third Field Day. Tampa will welcome thousands of students from Hillsborough County Public Schools.